This article is about a city. For the adjacent town of the same name, see Elmira (town), New York. Elmira /ˌɛlˈmaɪrə/ is a city in Chemung County, New York, US. It is the principal city of the Elmira, New York Metropolitan Statistical Area, which encompasses Chemung County, New York. The population was 29,200 at the 2010 census. It is the county seat of Chemung County. The City of Elmira is in the south-central part of the county, surrounded on three sides by the Town of Elmira. It is in the Southern Tier of New York, a short distance north of the Pennsylvania state line. This was long an area inhabited by indigenous people. In historic times, it was occupied by the Cayuga nation of the Iroquois Confederacy, also called the Kanawaholla. They had some relations with Europeans and English over fur trading, but were relatively isolated from the encroaching settlements. During the American Revolutionary War, the Sullivan Expedition of 1779 was mounted against the four Iroquois nations who had allied with the British and Loyalist forces. It fought a combined British-Iroquois force at the Battle of Newtown, south of the current city, in which Sullivan and his forces were victorious. After the conclusion of the war, the Iroquois and the new United States made a treaty at Elmira in 1791 to settle territorial disputes in the region. Most of the Seneca emigrated under pressure with the other Iroquois to Canada, where they resettled on land provided by the British Crown. The first European-American settler in Elmira was captain Abraham Miller of the Continental Army. He built a cabin after resigning just before the Revolutionary War. Miller's Pond and Miller Street are named after him and are near the location of his house. The New York legislature established the Township of Chemung, now Chemung County, in 1788. The settlement of Newtown was soon established at the intersection of Newtown Creek and the Chemung River. In 1792, the settlement at Newtown joined with the Wisnerburg and DeWittsburg settlements to form the village of Newtown. In 1808, the village officially changed its name to the Town of Elmira, at a town meeting held at Teal's Tavern. It is said the town was named after tavern owner Nathan Teal's young daughter, but that story has never been confirmed. In any case, the City of Elmira, also called "The Queen City", was incorporated in 1864 from part of the town of Elmira and the village of Elmira. The remaining part of the town of Elmira exists still, surrounding the city on the west, north and east. The city and town share an intricately entwined history. According to Amos B. Carpenter's Family History book printed in 1898, Elmira is named after Major General Matthew Carpenter's daughter. This occurred according to the book in 1821 at the constitutional convention which Matthew was a delegate to. Elmira served as a transportation hub for New York's Southern Tier in the 1800s, connecting commercial centers in Rochester and Buffalo with Albany and New York City, via the canal system and railroads. The city was the southern terminus of the Chemung Canal (completed in 1833); later, the Junction Canal was constructed to connect Elmira with Corning, facilitating transport of coal from the Pennsylvania mines via the Northern branch of the Susquehanna Canal system. In 1849, the New York and Erie Railroad was built through Elmira, giving the area a New York City to Buffalo route. In 1850, the Elmira and Jefferson Railroad gave the area a route north and the Elmira and Williamsport Railroad a route south in 1854. This made the city a prime location for an Army training and muster point early in the Civil War. In 1872 the Utica Ithaca and Elmira Railroad was begun, eventually creating a route to Cortland and Syracuse via Horseheads, Breesport and VanEtten. The Delaware, Lackawanna and Western Railroad was completed in 1884, which competed with the Erie's New York City to Buffalo line. A great deal of the 30-acre (120,000 m2) Union installation, known as Camp Rathbun, fell into disuse as the Civil War progressed, and the camp's "Barracks #3" were converted into a Civil War prisoner of war camp in the summer of 1864. The camp, in use from June 6, 1864 until autumn 1865, was dubbed "Hellmira" by its inmates. Towner's history of 1892 and maps from the period indicate the camp occupied a somewhat irregular parallelogram, running about 1,000 feet (300 m) west and approximately the same distance south of a location a couple of hundred feet west of Hoffman Street (Foster Avenue?) and Winsor Avenue, bordered on the south by Foster's Pond more or less, on the north bank of the Chemung River. In the months the site was used as a camp, 12,123 Confederate soldiers were incarcerated; of these, 2,963 died during their stay from a combination of malnutrition, prolonged exposure to brutal winter weather and disease directly attributable to the dismal sanitary conditions on Foster's Pond and lack of medical care. The camp's dead were prepared for burial and laid to rest by the sexton at Woodlawn National Cemetery, ex-slave John W. Jones. At the end of the war, each prisoner was given a loyalty oath and given a train ticket back home; the last prisoner left the camp on September 27, 1865. The camp was closed, demolished and converted to farmland. Woodlawn Cemetery, about 2 miles (3 km) north of the original prison camp site (bounded by West Hill, Bancroft, Davis and Mary Streets), was designated a "National Cemetery" in 1877. The prison camp site is today a residential area. As Elmira grew, so did the citizens' concern about increased crime after the end of the war; the idea of constructing a reformatory within the city had been discussed for some years. Finally, lands on which the present-day Elmira Correctional Facility resides, approximately 280 acres (1.1 km2) in all (north of Bancroft across the street from Woodlawn Cemetery), were purchased in 1869 and 1870 by the state legislature, specifically for construction of the reformatory and an armory. These lay within the boundaries of the town of Elmira, rather than the city. Around the same time, Dr. Eldwin Eldridge purchased a large tract of wilderness (~ 100 acres (0.4 km2)) with a small pond, also within the township and developed it into a fabulous garden spot. His sudden death in 1876 put paid to his plans to develop the land further. After his death, Dr. Eldridge's estate granted access to the parkland to Elmira residents and tourists. In 1889, the city purchased the land, calling it Eldridge Park in the doctor's honor. The park this time held a nearly 15-acre (61,000 m2) lake in its center, along with marble statuary, flower gardens, fountains, driving and walking paths and a labyrinth. In 1890, along with Eldridge Park, the reformatory and armory, the city added a well-populated area known as "Carr's Corners", an area bounded by Hoffman, West Hill and Hillcrest (old Carr Road) - and appears to include the residential area around and to the south of Woodlawn National Cemetery. . In 1950, the population of the City of Elmira peaked at about 50,000, which represented 57 percent of Chemung County’s total population at that time. Today, the City has approximately 30,000 residents, which represents 34 percent of Chemung County’s total population. This population decline is due to the national decline in railroads and manufacturing as well as a population shift to the outer suburbs around Elmira. The Elmira Metro area has nearly 100,000 in population. The population decline began during the recession of the early 1970s during which several large employers (Ann Page, American Bridge, General Electric, American LaFrance, Westinghouse and Remington Rand) either closed their factories or moved to other states. The decline was exacerbated by the flood of 1972, during which many of the downtown businesses and single-family homes were destroyed or replaced by subsequent Urban Renewal projects in the Chemung River flood plain. Anchor Glass Container Corporation, headquartered in Tampa, Florida, is located in the old Thatcher Glass facility in Elmira Heights. Anchor Glass produces a diverse line of flint, amber, green and other colored glass containers of various types and designs for the beer, food, beverage and liquor markets in North America. Anchor Glass is now wholly owned by the Ardagh Group S.A..
CAF-USA Inc has its main U.S. plant in Elmira Heights on the site of the former American Bridge Company. CAF USA is a subsidiary company of Construcciones y Auxiliar de Ferrocarriles, a Spanish manufacturer of passenger rail products (including trains, high-speed trains, locomotives, light rail vehicles and other rail equipment). CAF-USA Inc trains are typically designed for North America's market, based on Spanish design and technologies. Elmira Heat Treating, established in 1962 and located in Elmira, offers a wide variety of heat treatment technologies to both domestic and international customers such as Hilliard Corp., Ford Motors, General Signal and others. Hardinge, Inc. (formerly Hardinge Brothers), established in 1890 and now headquartered in Elmira, manufactures precise turning machines for the domestic and international market. Starting in 1995, Hardinge began expanding their product line and over the years has acquired L. Kellenberger & Co. AG, Hauser-Tripet-Tschudin AG, Jones & Shipman, and Usach Technologies, Inc. In 2004 they also acquired Bridgeport, world-famous for its milling machines and machining centers. Hilliard Corporation, established in 1905, has two locations in Elmira and serves the international market in filters, brakes, clutches and starters for a variety of industrial and commercial uses as well as consumer equipment from Polaris and MTD. Kennedy Valve, located in Elmira since 1905, is one of the world's largest manufacturers of products for waterworks distribution, potable and wastewater treatment, and fire protection system projects. They are most famous for their fire hydrants which can be found around the world. Kennedy Valve was acquired by McWane in 1925. Trayer Products, established in 1929, is located in Elmira and manufactures parts mostly for the heavy truck industry; primarily truck chassis parts such as king pins and shackles. On July 26, 2012, an EF1 tornado touched down near Cottage Drive off of Route 352 and traveled through Golden Glow and the rest of the city. Moderate damage was seen after the storm passed and hundreds of trees and power lines were blown down. No one was injured. The tornado was 0.5 miles (0.80 km) wide and took the city by surprise as this area has not been prone to tornadic activity. Elmira is at 42°5′23″N 76°48′34″W﻿ / ﻿42.08972, -76.80944 (42.089874, −76.809559). According to the United States Census Bureau, the city has an area of 7.6 sq mi (19.6 km2), of which, 7.3 sq mi (19.0 km2) of it is land and 0.27 sq mi (0.7 km2) of it (3.56%) is water. The Chemung River flows eastward through the city. Elmira is built almost entirely in the flood plain of the Chemung River and has suffered many floods, the worst from Hurricane Agnes in 1972. Newtown Creek, flowing from the north, joins the Chemung River at the city's southeast corner. New York State Route 17, The Southern Tier Expressway, connects with the city at Exit 56. New York State Route 14 passes through Elmira between Watkins Glen and Pennsylvania. New York State Route 13 begins near Lake Ontario and travels through Cortland and Ithaca before ending in Elmira. New York State Route 352 begins in Elmira at Exit 56 of the Southern Tier Expressway and continues West into Corning. As of the census of 2000, there were 30,940 people, 11,475 households, and 6,701 families residing in the city. The population density was 4,229.5 people per square mile (1,632.0/km²). There were 12,895 housing units at an average density of 1,762.7 per square mile (680.2/km²). The racial makeup of the city was 82.03% White, 13.05% Black or African American, 0.39% Native American, 0.49% Asian, 0.03% Pacific Islander, 1.37% from other races, and 2.64% from two or more races. Hispanic or Latino of any race were 3.14% of the population. There were 11,475 households out of which 31.1% had children under the age of 18 living with them, 35.3% were married couples living together, 18.4% had a female householder with no husband present, and 41.6% were non-families. 34.5% of all households were made up of individuals and 13.6% had someone living alone who was 65 years of age or older. The average household size was 2.37 and the average family size was 3.05. In the city, the population was spread out with 25.1% under the age of 18, 13.0% from 18 to 24, 29.9% from 25 to 44, 18.2% from 45 to 64, and 13.8% who were 65 years of age or older. The median age was 33 years. For every 100 females there were 101.2 males. For every 100 females age 18 and over, there were 98.2 males. The median income for a household in the city was $27,292, and the median income for a family was $33,592. Males had a median income of $31,775 versus $22,350 for females. The per capita income for the city was $14,495. About 17.9% of families and 23.1% of the population were below the poverty line, including 32.6% of those under age 18 and 12.1% of those age 65 or over. 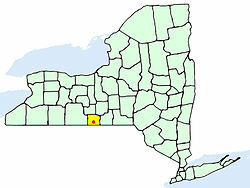 The Elmira Metropolitan Statistical Area (or Elmira MSA) is frequently used for statistical information such as labor rates and includes all of Chemung County with a population in 2000 of 90,070. The Elmira MSA was ranked as the 59th safest place to live out of 344 Metro Areas in 2005 by Morgan Quitno Press. The three largest ethnic groups in Elmira are Irish, German and Italian. The city government is a Council-Manager form of government in which the City Manager is the primary administrator of the City. There is one mayor elected at large and six council members elected from each of six council districts. The term of office of the mayor and councilmembers was 2 years until a referendum passed in 2003 extended the terms to 4 years (4 year terms began after the 2007 election). The mayor and councilmembers are all part-time employees. The City Manager, City Clerk, City Chamberlain, City Assessor, and Corporation Counsel are all appointed by the City Council. All remaining department heads serve at the request of the City Manager. The city has 125 miles (201 km) of road, 210 miles (340 km) of water lines, and 175 miles (282 km) of sewer lines. There are four ZIP codes in the City of Elmira: 14901 (northside), 14902 (downtown), 14904 (southside), and 14905 (West Elmira). The city police department employs approximately 81 full-time officers. The city fire department employs approximately 60 full-time firefighters and officers. The city animal shelter has a goal to become by 2007 a no-kill animal shelter based on a model by Tompkins County Society for the Prevention of Cruelty to Animals. The city received $1.4 million in Community Development Block Grant funds and $368,000 in HOME funds in FY2006-2007 from the U.S. Department of Housing and Urban Development. These funds are used for programs and projects for low-moderate income families and neighborhood blocks. The City of Elmira has more than 20 parks including Eldridge Park with a walking trail, restored carousel, skateboard park, and fishing lake and Wisner Park with memorials to veterans from World War I, World War II, the Vietnam War and the Fallen Officers Memorial. The City Manager of the City of Elmira is currently  P. Michael Collins. Naming rights to the Millers Pond Park were obtained by J. Howard "Buzz" Miller, an early-20th century benevolent industrialist, when his horse "Mumbo Jumbo" won a 1912 race at the Tioga Downs horse track. The Chief of Police is currently  Joseph Kane. The City Slogan is "Honoring the Past, Building the Future". It is featured on an Entrance sign erected in 2003 into the City from Exit 56 of the Southern Tier Expressway along with other honored Elmirans including (L to R) Brian Williams, Hal Roach, Ernie Davis, Mark Twain, Eileen Collins, John Jones, and Tommy Hilfiger. The slogan was designated by Mayor Stephen Hughes following the conclusion of a slogan contest in which Marlin Stewart, Alan and Barbara Hutchinson, and James Lloyd were recognized for their contributions to the winning slogan. On at least two hilltops near the city (mostly on Harris Hill to the northwest) pioneer pilots established the sport of gliding in America. Harris Hill is the site of the National Soaring Museum. These sites are now recognized as National Landmarks of Soaring. Dunn Field is a baseball stadium located along the banks of the Chemung River on the south side. The Elmira Pioneers play at Dunn Field. Famous players and managers that have played or managed at Dunn Field include Babe Ruth, Earl Weaver, Don Zimmer, Wade Boggs, and Curt Schilling. Elmira College is located in the city. The Clemens Center is a concert and theater center named after Samuel Clemens, (Mark Twain). The Arnot Art Museum is located in the downtown Civic-Historic District. Woodlawn Cemetery and Woodlawn National Cemetery are both located in the City of Elmira in the Northwest sector. Mark Twain and his family are buried in Woodlawn Cemetery. The First Arena was built in Elmira in 2000 (originally opened as the Coach USA Center). From 2007 to 20017 it was home of the Elmira Jackals hockey franchise, before they disbanded in 2017. It currently is used for concerts and small hockey events. The John Brand Jr. House, John Brand Sr. House, Buildings at 104-116 West Water St., Chemung Canal Bank Building, Chemung County Courthouse Complex, Clinton–Columbia Historic District, Elmira Civic Historic District, Elmira Coca-Cola Bottling Company Works, Elmira College Old Campus, Emmanuel Episcopal Church, Erste Deutsche Evangelische Kirche, Alexander Eustace House, Fire Station No. 4, William S. Gerity House, F. M. Howell and Company, John W. Jones House, Maple Avenue Historic District, Near Westside Historic District, Newtown Battlefield State Park, Park Church, Pentecostal Holy Temple Church of Jesus Christ, Pratt House, Quarry Farm, St. Patrick's Parochial Residence-Convent and School, Trinity Church, and Woodlawn Cemetery and Woodlawn National Cemetery are listed on the National Register of Historic Places. Star-Gazette, daily morning newspaper owned by Gannett Co. Inc. It was Gannett's first newspaper. The Chemung County Transit System operates regularly scheduled fixed route service within the City of Elmira and Village of Horseheads. Another route links Elmira with Corning Community College, also linking passengers with the Steuben County Transit System (SCT) and Corning Erwin Area Transit System (CEATS). The Elmira Corning Regional Airport (IATA code ELM, ICAO code KELM) is a medium-size regional airport, and the only area airport that offers scheduled airline service. Located 7 miles (11 km) northwest of downtown, the airport has non-stop flights to Detroit on Delta Air Lines and two routes to Florida on Allegiant Air. ^ "2016 U.S. Gazetteer Files". United States Census Bureau. https://www2.census.gov/geo/docs/maps-data/data/gazetteer/2016_Gazetteer/2016_gaz_place_36.txt. Retrieved Jul 4, 2017. ^ a b "Population and Housing Unit Estimates". https://www.census.gov/programs-surveys/popest/data/tables.2016.html. Retrieved June 9, 2017. ^ "Chemung County History Timeline 1771-2013". Chemung County History. http://www.chemunghistory.com/pages/timeline.html. Retrieved 2015-07-17. ^ "This Day in History: Battle of Chemung, or Newtown, New York". History.com. http://www.history.com/this-day-in-history/battle-of-chemung-or-newtown-new-york. Retrieved 2015-07-17. ^ Janowski, Diane (2014-12-31). "Elmira History: Treaty of Painted Post signed in Elmira". Star Gazette Newspaper. Retrieved on 2015-07-17. ^ "Elmira Wedding Resources / History". http://www.fingerlakesbrideguide.com/elmira_more_weddings.html. Retrieved 2016-08-21. ^ "Anchor Glass Container Corporation". http://www.anchorglass.com/. Retrieved 8 November 2016. ^ Editorial, Reuters. "Ardagh buys Anchor Glass for 721 mln euros". http://in.reuters.com/article/2012/07/17/ardagh-anchorglass-acquisition-idINL6E8IHKVY20120717. Retrieved 8 November 2016. ^ "CAF Raillway Solutions - CAF Construcciones y Auxiliar de Ferrocarriles". http://www.cafusa.com/. Retrieved 8 November 2016. ^ "Home". http://www.elmiraht.com/. Retrieved 8 November 2016. ^ "Hardinge Group - The Machine Tool Leader". http://www.hardinge.com/. Retrieved 8 November 2016. ^ "SEC Info - Hardinge Inc - ‘8-K’ for 11/29/95". http://www.secinfo.com/dsVsd.aXq.htm. Retrieved 8 November 2016. ^ "Purchase of Swiss Trio Makes Hardinge More Competitive in Grinders. - Free Online Library". http://www.thefreelibrary.com/Purchase%20of%20Swiss%20Trio%20Makes%20Hardinge%20More%20Competitive%20in%20Grinders.-a069372083. Retrieved 8 November 2016. ^ "Machinery News Articledetailaspxarticleid=46992 - Machinery". http://www.machinery.co.uk/machinery-news/hardinge-acquires-us-grinding-machine-maker/46992/. Retrieved 8 November 2016. ^ "PM News: Hardinge Acquires Bridgeport Machine". http://www.productionmachining.com/columns/pm-news-hardinge-acquires-bridgeport-machine. Retrieved 8 November 2016. ^ "Home". http://www.hilliardcorp.com/. Retrieved 8 November 2016. ^ "Hilliard Featured in Local Business Profile". http://www.chemungchamber.org/news-item/735303-hilliard-featured-in-local-business-profile. Retrieved 8 November 2016. ^ "Kennedy Valve - Manufacturers of Quality Waterworks Products". http://www.kennedyvalve.com/. Retrieved 8 November 2016. ^ "History of McWane Corporation – FundingUniverse". http://www.fundinguniverse.com/company-histories/mcwane-corporation-history/. Retrieved 8 November 2016. ^ "Trayer". http://www.trayerproducts.com/. Retrieved 8 November 2016. ^ "author.html". Archived from the original on 8 November 2016. https://web.archive.org/web/20161108140405/http://teddarnoldbooks.com/author.html. Retrieved 8 November 2016. ^ "ARNOT, John, Jr. - Biographical Information". http://bioguide.congress.gov/scripts/biodisplay.pl?index=A000301. Retrieved 8 November 2016. ^ "Massachusetts Governor: Charlie Baker (R)". National Journal. http://www.nationaljournal.com/almanac/2014-new-members/massachusetts-governor-charlie-baker-r-20141105. Retrieved 25 November 2014. ^ "Welcome to the Mark Twain House & Museum - Olivia Langdon Clemens". http://www.marktwainhouse.org/man/olivia_langdon_clemens.php. Retrieved 8 November 2016. ^ "Chip Coffey". http://www.imdb.com/name/nm1368465/bio. Retrieved 8 November 2016. ^ "All-American Girls Professional Baseball League official website profile". http://www.aagpbl.org/index.cfm/profiles/cook-clara/251. Retrieved 28 February 2012. ^ "Court of Appeals". Historical Society of the New York Courts. http://nycourts.gov/history/legal-history-new-york/luminaries-court-appeals/collin-frederick.html. Retrieved 2016-11-08. ^ "Official Biography on NASA website". http://www.jsc.nasa.gov/Bios/htmlbios/collins.html. Retrieved 27 June 2011. ^ "Ernie Davis". Biography.com. http://www.biography.com/people/ernie-davis-9267805. Retrieved 2016-11-08. ^ "Stan Drulia". http://espn.go.com/nhl/player/_/id/230/stan-drulia. Retrieved 8 November 2016. ^ "FASSETT, Jacob Sloat - Biographical Information". http://bioguide.congress.gov/scripts/biodisplay.pl?index=F000042. Retrieved 8 November 2016. ^ "Alumni in the Theater - Clyde Fitch - Amherst College". https://www.amherst.edu/library/archives/exhibitions/play/alumni/fitch. Retrieved 8 November 2016. ^ Dorsen, D. M. (2012). Henry Friendly, greatest judge of his era. Cambridge, Mass: Belknap Press of Harvard University Press. ^ "Josh Furnas". http://espn.go.com/college-football/player/stats/_/id/152411/josh-furnas. Retrieved 8 November 2016. ^ "Retired Site - PBS Programs - PBS". https://www.pbs.org/wnet/ihas/composer/griffes.html. Retrieved 8 November 2016. ^ "Tommy Hilfiger". Biography.com. http://www.biography.com/people/tommy-hilfiger-594098. Retrieved 2016-11-08. ^ "Molly Huddle Bio :: Notre Dame Track & Field :: UND.COM :: The Official Site of Notre Dame Athletics". http://www.und.com/sports/c-track/mtt/huddle_molly00.html. Retrieved 8 November 2016. ^ Design, Janowski Web. "The John W. Jones Story Part One". http://www.johnwjonesmuseum.org/jwjstory.html. Retrieved 8 November 2016. ^ "McMILLEN, Charles Thomas - Biographical Information". http://bioguide.congress.gov/scripts/biodisplay.pl?index=M000573. Retrieved 8 November 2016. ^ "Kirt Manwaring". http://espn.go.com/mlb/player/stats/_/id/1957/kirt-manwaring. Retrieved 8 November 2016. ^ "William Perry Bio - William Perry Career". http://www.mtv.com/artists/william-perry/biography/. Retrieved 8 November 2016. ^ Hal Roach. (2013). The Biography Channel website. Retrieved 04:10, Sep 12, 2013, from http://www.biography.com/people/hal-roach-9459667. ^ "Joey Sindelar - Official PGA TOUR Champions Profile". http://www.pgatour.com/players/player.02101.joey-sindelar.html. Retrieved 8 November 2016. ^ "Biography of Joel Dorman Steele". http://www.steele.lib.ny.us/steelbio.htm. Retrieved 8 November 2016. ^ Woodhouse, Mark. "Mark Twain and Elmira". New York State Archives. Archived from the original on 2011-07-06. http://webarchive.loc.gov/all/20110706133637/http://www.archives.nysed.gov/apt/magazine/archivesmag_winter2011.pdf. ^ This article incorporates text from the public domain Dictionary of American Naval Fighting Ships. The entry can be found here. ^ "Bob Waterfield". http://www.nfl.com/player/bobwaterfield/2528326/profile. Retrieved 8 November 2016. ^ Brian Williams. (2013). The Biography Channel website. Retrieved 04:14, Sep 12, 2013, from http://www.biography.com/people/brian-williams-16243253. ^ "Ballparks of the PGCBL: Dunn Field". http://www.pgcbl.com/news/index.html?article_id=489. Retrieved 8 November 2016. ^ "Ray Wehnes Barker Major General, US Army - Army - Military Page - Ancestry.com". http://trees.ancestry.com/view/Military.aspx?tid=5823047&pid=6946145640&vid=34b07b91-da3e-4cbc-96e5-7b3ce7adb3e2. Retrieved 8 November 2016. ^ "NowData - NOAA Online Weather Data". National Oceanic and Atmospheric Administration. http://www.nws.noaa.gov/climate/xmacis.php?wfo=bgm. Retrieved 2012-03-27. ^ "Census of Population and Housing". Census.gov. Archived from the original on May 12, 2015. https://www.webcitation.org/6YSasqtfX?url=http://www.census.gov/prod/www/decennial.html. Retrieved June 4, 2015. ^ "FIRST ARENA: New owner, but Jackals leaving". Star-Gazette. March 10, 2017. http://www.stargazette.com/story/news/local/2017/03/09/first-arena-county-plans-friday-announcement/98958172/. ^ "National Register of Historic Places". WEEKLY LIST OF ACTIONS TAKEN ON PROPERTIES: 11/08/10 THROUGH 11/12/10. National Park Service. 2010-11-19. http://www.nps.gov/history/nr/listings/20101119.htm. ^ "Weekly List of Actions Taken On Properties: 1/03/12 Through 1/06/12". January 6, 2012. nps.gov. http://www.cr.nps.gov/nr/listings/20120113.htm. Retrieved 11 June 2013. ^ "National Register of Historic Places". Weekly List of Actions Taken on Properties: 8/12/13 through 8/16/13. National Park Service. 2013-08-23. http://www.nps.gov/history/nr/listings/20130823.htm. Wikisource has the text of the 1905 New International Encyclopedia article Elmira. This page uses content from the English language Wikipedia. The original content was at Elmira, New York. The list of authors can be seen in the page history. As with this Familypedia wiki, the content of Wikipedia is available under the Creative Commons License.